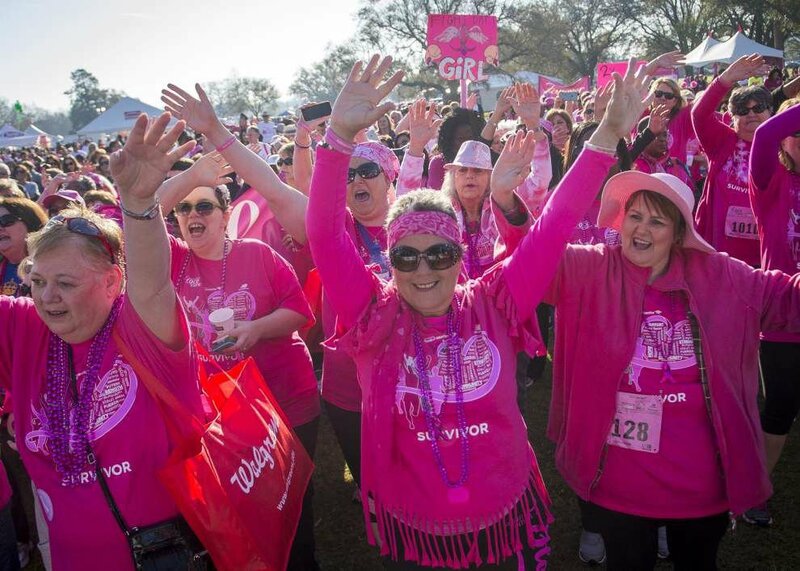 Advocate staff photo by BRIANNA PACIORKA -- Breast cancer survivors sing and dance during a survivor celebration at The Susan G. Komen Race for the Cure held at LSU on Saturday. Advocate staff photo by BRIANNA PACIORKA -- Breast cancer survivors parade during The Susan G. Komen Race for the Cure held at LSU on Saturday. Advocate staff photo by BRIANNA PACIORKA -- A 'I Will Survive' sign is held up as breast cancer survivors line up for the Survivors Parade during The Susan G. Komen Race for the Cure held at LSU on Saturday. Advocate staff photo by BRIANNA PACIORKA -- Thousands begin their walk or run in the 5K race during The Susan G. Komen Race for the Cure held at LSU on Saturday. Advocate staff photo by BRIANNA PACIORKA -- Decorated bras made by The Boobie Bunch are sold during The Susan G. Komen Race for the Cure held at LSU on Saturday, March 5, 2016. Advocate staff photo by BRIANNA PACIORKA -- Breast cancer survivor Theresa Martin waves to the crowd as she begins her 5K walk during The Susan G. Komen Race for the Cure held at LSU on Saturday. Advocate staff photo by BRIANNA PACIORKA -- Runners take off for a 5K race during The Susan G. Komen Race for the Cure held at LSU on Saturday, March 5, 2016. Advocate staff photo by BRIANNA PACIORKA -- Breast cancer survivor Dana Jones celebrates during a survivor celebration at The Susan G. Komen Race for the Cure held at LSU on Saturday, March 5, 2016. At Baton Rouge’s annual Susan G. Komen Race for the Cure, it’s never hard to find emotional stories about people’s experiences with breast cancer. Many tell of how they overcame cancer with the support of friends and family, or share their memories of loved ones the disease took away from them. For others, like Margaret Everett, that story is still being written. Everett, 51, is fighting cancer for the third time since her initial diagnosis in 2003. When she was diagnosed once again with cancer in January 2015, she learned the disease had metastasized and spread to her bones. On Saturday, Everett was the celebrity of the day and rode in a pace car at the front of the 5K race. Bystanders cheered as the car and race participants took off. Many people didn’t run but instead walked. They wore number tags on which they’d written a person they wanted to honor: moms, aunts, sisters and friends who have had breast cancer. 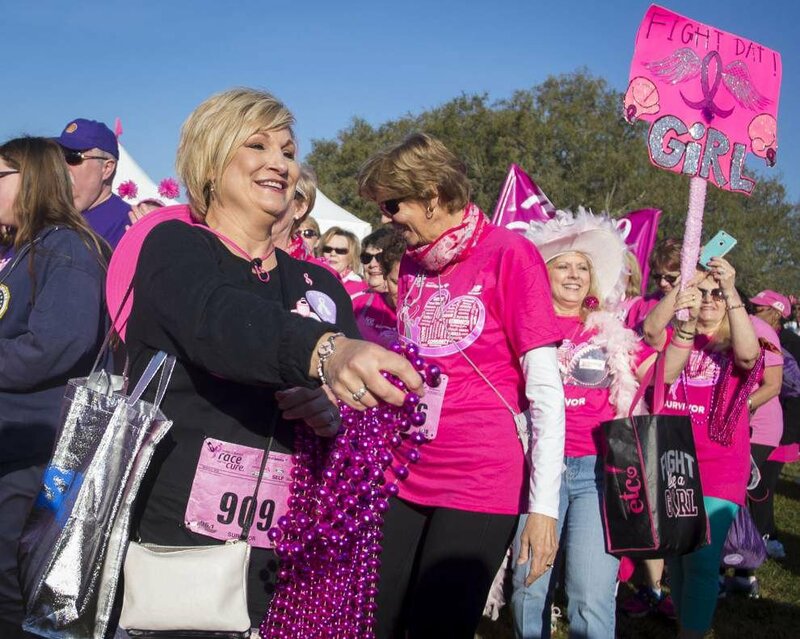 The race, now in its 20th year, brings together a sisterhood — and some of their brothers, too — of thousands every year, said Komen Baton Rouge Executive Director Angela Miller. This year’s crowd was estimated at 9,000. The race kicks off a 30-day fundraising period for Komen Baton Rouge, which hopes to raise $200,000 this year, Miller said. About 75 percent of that money stays in the Baton Rouge area to pay for free screenings and educational programs, plus assistance with treatments and prescriptions for those battling the disease. The rest helps fund research. “We can only have more survivors through the money we raise that goes toward research,” Miller said. Before the 1-mile fun run, 5K and 10K races started, hundreds of women and some men lined up for the Survivor’s Parade — probably the most important, and emotional, part of the Race for the Cure, Miller said. They marched through the packed Old Front Nine carrying banners indicating how long it’s been since they’ve beaten cancer. For some, it’s been only a year or two, while others fought cancer decades ago. A new banner was added to the parade this year: one reading “Forever Fighters,” honoring people like Everett, who have metastatic breast cancer. Despite that outlook, Everett said she has plenty of reasons to stay positive, often finding strength in the company of her children and grandchildren. “Any day this side of the daisies is a good day,” Everett continued with a laugh. At one of several tents near the race route, Tressie Madere and Missy Vascocu were selling bras they had decorated with feathers, beads and sequins, which some customers fastened on over their race clothes. They’re part of the “Boobie Bunch” team from their workplace, Crestmark, where three co-workers have survived breast cancer. The women said they planned to donate the proceeds of their sale to Komen’s research fund. Vascocu said the bras, while a bit silly, are meant to show breast cancer patients that “you can still be pretty.” And they can still have fun, Madere added. Under a nearby tent, Pam Bordelon waited for the festivities to begin with a team of relatives, named “Green Eggs and Pam” by her oldest son, who is an avid runner. Bordelon, 59, who is not The Advocate’s society writer, said they’ve been making the drive from their home in Berwick to Baton Rouge for the race ever since 2014, when she was diagnosed with breast cancer. Bordelon choked up a little as she reflected on her experience and offered advice to people dealing with cancer.